A simple and easy to put into practice Yantra Experiment, which makes the use of the famed Pandrah Ka Yantra to attract and mesmerize a specified person for the end motive of love, marriage, business or friendship by bringing that person under a Voodoo Vashikaran Spell has been described by me in this post. 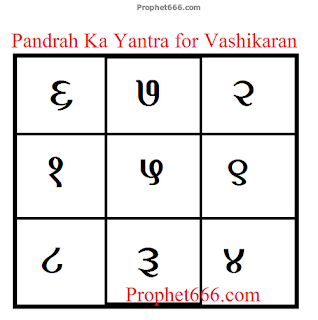 The Pandrah Ka Vashikaran Yantra can also be prepared and used in the same manner to get success in any specified task, work or job, including success in a job interview, loan application or business proposal. It should be noted that this is a one-time experiment and is practiced either to put a Love Spell on a specified person or for getting success in any specific task. However, the experiment can be practiced again and again for getting success in attracting other persons or getting success in different tasks. 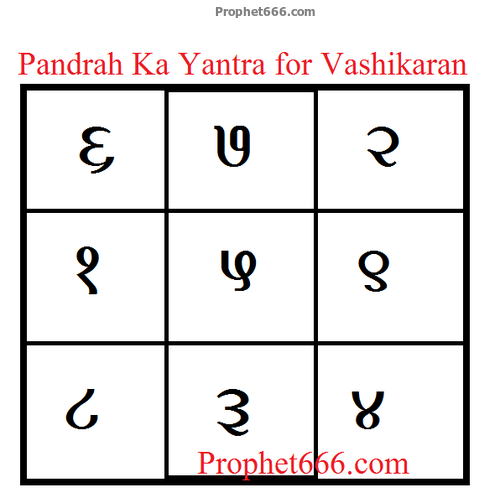 1] The Pandrah Ka Vashikaran Yantra should be prepared during the period of any Shubh Nakshatra in the Shukla Paksha of the Month. 2] The Yantra should be drawn on a Bhojpatra with Yaksha Kardam Paste, using a Chameli Kalam[small pointed stick of a Jasmine tree]. 3] Then the simple ritual of lighting a Ghee Lamp and Agarbatti, in-front of the Yantra should be performed, after, which the Yantra should be worshiped and the name of the desired person or desired work should to taken and the practitioner should pray to the Pandrah Ka Yantra to grant him or her success in making his prayer come true. 4] The Pandrah Ka Yantra can be kept in a metal locket and worn around the neck or kept in the pocket of the shirt, pant or dress. This completes the Pandrah Ka Yantra Vashikaran Experiment. The Pandrah Ka Yantra can also be prepared using the Numerical Combination given below, which vibrates to the same frequencies. Next time leave your comment only on the concerned post. If the remedy has benefited you, then not having Bhojpatra is a small problem, you can obtain Bhojpatra and make the Yantra. No, it should be written on Bhojpatra, but can be kept in the wallet.